HAILEY, Idaho (CNN) -- Jeff Gunter stood on his flatbed truck and spoke directly to U.S. Army Pvt. Bowe Bergdahl, captured by the Taliban in Afghanistan. 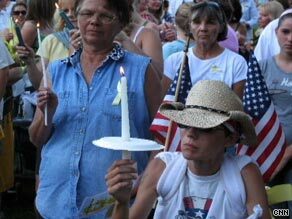 Residents of Bowe Bergdahl's hometown of Hailey, Idaho, hold a vigil for him Wednesday night. "Bowe, when you get back I want to go to the top of the mountains with you so you can look and see what this city has done for you," Gunter told a crowd who had gathered in Hailey, Idaho, Wednesday night to show their support for the soldier. "The yellow ribbons are all over." People walked and rode their bikes -- Bergdahl's preferred way of getting around in his small mountain town -- and they stood for a solemn singing of the national anthem. Bergdahl's parents, Bob and Janie, did not come to the vigil but a note from them was read aloud, explaining how overwhelmed they have been by their neighbors' support. "Bowe, our only son, know that we love you and that people around the world are praying for your safe return to our arms." Bergdahl was captured three weeks ago in the Paktika province in southeastern Afghanistan, according to the Department of Defense. The Taliban is holding him, threatening to kill him if foreign troops continue search operations in Ghazni and Paktika provinces, which they claim target civilians, according to Taliban commander Mulvi Sangeen. CNN contacted Sangeen by telephone last week. On Sunday, a video was released of Bergdahl dressed in loose-fitting blue clothes and sitting on the floor in a location that American officials are not pinpointing publicly. He got emotional talking about his family, saying he was afraid he would not get to come home. Just a few weeks ago, Bergdahl wrote an e-mail to his father, family friend Wayne Clayton told CNN. The young soldier spoke about a harrowing incident in which his convoy hit a bomb in the road. "The axle's blown out of it," said Clayton, but the tone of Bergdahl's e-mail was "upbeat." "He's not scared. [He's a] typical 20-year-old soldier in the U.S. Army, just experiencing everything they can." Bergdahl was home- schooled and was taught chivalry at a young age, friends and neighbors of his family say. They say he is able to have a conversation with anyone, and has a natural curiosity. "Bowe is not somebody in the corner," said Sue Martin, the owner of Zaney's Coffee Shop in Hailey, where Bergdahl once worked as a barista. "You engage and he engages very well." "He captures you," Martin said. She recalled going to her car after a snowstorm and seeing that the snow had been scrapped off. "Bowe would have been out there... He would never say anything," Martin said. Her shop has become the epicenter of hometown support, with people leaving notes to him. "Always a knight searching for what is good and right and true in the world," one of them read. CNN's Ed Lavandera and Paul Vercammen contributed to this report.